Any time I have called your office I received courteous help and attention. Our European standardized ginkgo biloba from Euromed is manufactured under rigorous quality control standards and its efficacy has been demonstrated in clinical trials. 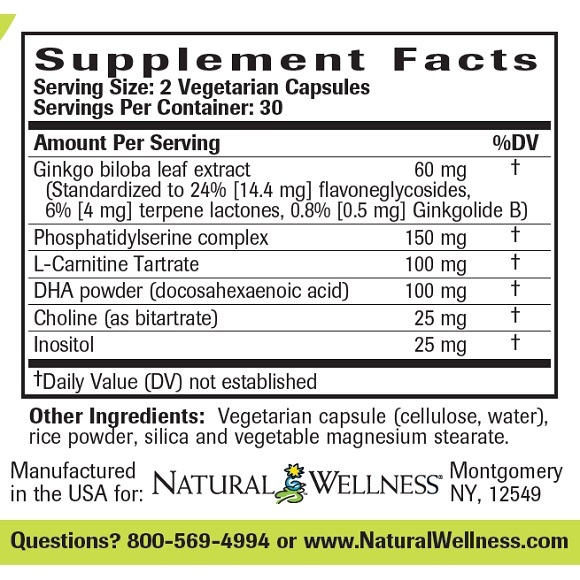 Ginkgo biloba protects the elasticity and health of blood vessels that supply the brain. 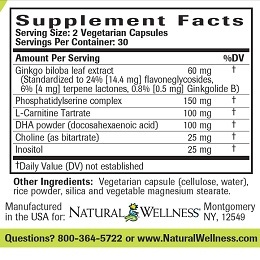 Ginkgo helps support normal, healthy circulation to the brain. Improved brain circulation may help support oxygen and glucose uptake as well as removal of waste products, all of which contribute to healthy brain function.Ginkgo also contains potent antioxidants to help protect the brain against the damaging effects of free radicals. Contains SerinAID®, a superior form of Phosphatidylserine from Chemi Nutra. Phosphatidylserine helps provide structural support for brain cell membranes, critical for normal, healthy brain function. 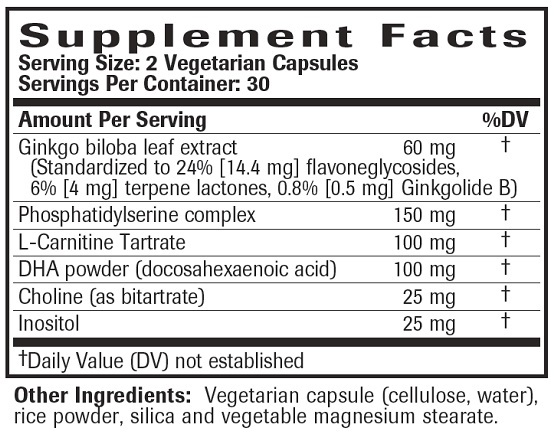 Phosphatidylserine may help support memory, concentration, focus and other cognitive functions. 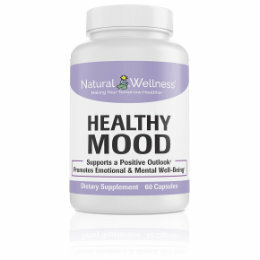 In addition Phosphatidylserine helps promote healthy levels of the stress hormone cortisol, which when produced in excess can impact healthy brain function. 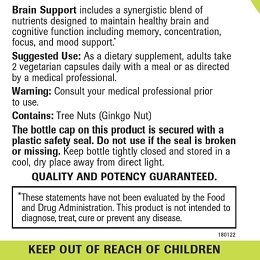 Features Neuromins® DHA, also known as life’sDHA™. Neuromins® DHA is derived from marine microalgae and is the only vegetarian and sustainable source of DHA. DHA is an omega-3 fatty acid that is critical to the normal structure and function of nerve cell membranes. The brain and retina contain the highest levels of DHA in the body. DHA helps support the brain’s ability to transmit nerve signals and studies show this fatty acid is intimately involved in brain function, particularly mood, memory and behavior. A new study in the journal Neurology found low levels of omega-3 fatty acids can age your brain faster as well as lower your memory and thinking abilities. 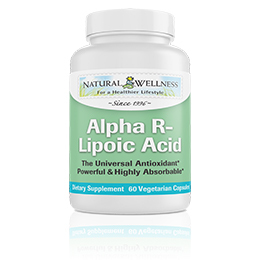 Provides acetyl-L-carnitine, a form of L-carnitine and an amino acid, that is able to pass through the highly selective blood-brain barrier. Acetyl-L-carnitine helps support the production of the neurotransmitter acetylcholine, which is essential for normal, healthy brain function. Acetyl-L-carnitine has been shown to play a role in maintaining normal brain function as we age, and studies demonstrate acetyl-L-carnitine helps support memory and promote a positive mood. Choline serves as an acetylcholine precursor, an ingredient vital for the body to produce acetylcholine. Acetylcholine is an essential neurotransmitter involved in memory, cognition, sleep, and neuromuscular control. Inositol helps balance chemicals in the body, including serotonin in the brain, as well as helps synthesize choline. 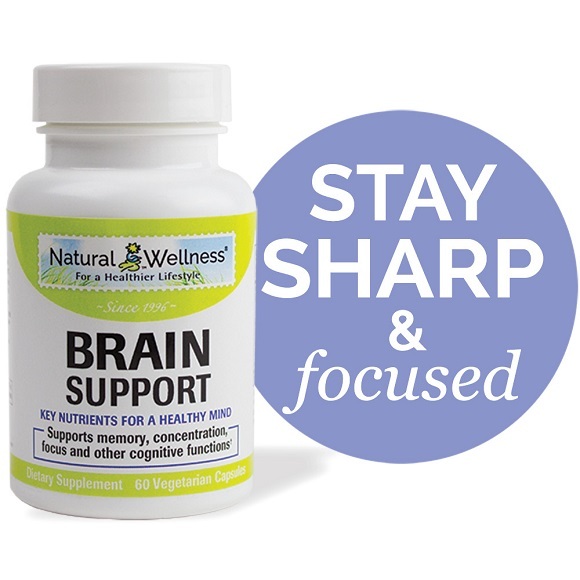 Brain Support is a synergistic combination of “smart” nutrients designed to help support normal, healthy brain function. Supporting brain function is vital as we age. Our Brain Support formula is designed to help support healthy cognitive function throughout the aging process and to combat the daily stresses put upon the brain by our environment and our health. By supporting key structures and functions in the brain such as circulation, cell integrity, waste removal and neurotransmission, we are able to support the brain's ability to function properly. 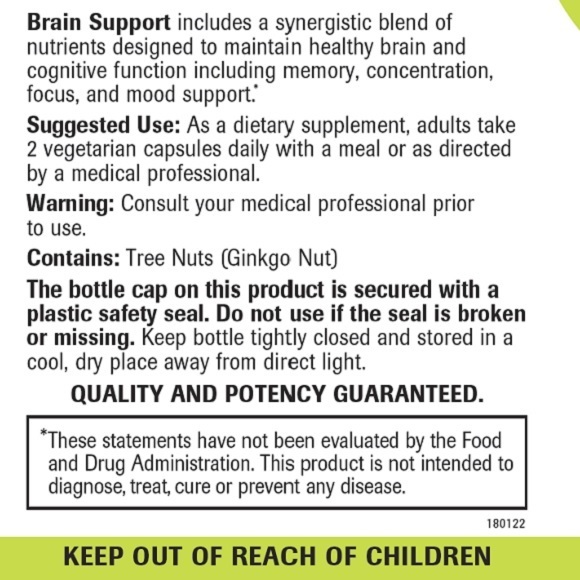 Along with structural support, we added nutrients shown to protect and support cognitive abilities, such as memory, concentration, focus and mood. Brain Support is a powerful formula recommended for those who wish to support and protect their brain and mental status, both for today and years to come. Cognitive function can be diminished for various reasons. The aging process can naturally slow the brain down over time. Lifestyle, health and the environment can be detrimental to brain and cognitive health. Environmental pollution, smoking, excessive drinking and other toxins can damage the brain. Various health issues can damage the brain, such as liver disease which may lead to an increase in toxins within the brain. And of course, brain specific diseases, such as Alzheimer’s, can have a devastating effect on one’s life and family. As a vital organ, the brain should be protected and supported whenever possible. Please consult with a medical professional prior to use especially if you have or suspect you might have a medical condition, are currently taking prescription drugs, or are pregnant or breastfeeding. Brain Support is MANUFACTURED in the USA to meet FDA strict current Good Manufacturing Practice regulations (cGMP).